Candles add something special to a home. The flickering of a flame is both mysterious and comforting; we can't resist the cozy glow. Point a la Ligne candles are made from the highest quality ingredients, and they burn slowly with no drips or smoke. 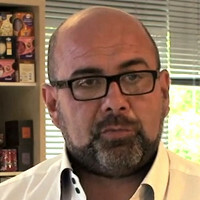 The company began in Bordeaux, France over 100 years ago. Their inspiration is "to bring together the beauty, warmth and magic of the flame." Treating their designs like a high fashion brand, Point a la Ligne debuts two collections per year: Spring/Summer and Fall/Winter. People wait to see what kinds of unique designs the team will unveil each season. It's no wonder that fashion houses like Prada, Armani, and more have Point a la Ligne design candles for them. The Atlantic Shore collection looks like it's been plucked from the ocean. Each candle is handmade and hand-painted by expert craftsmen. Painstaking detail and a smooth glaze leaves them looking almost more like porcelain than wax. Treat your own décor to one of these treasures, or make an impression on a friend or hostess with candles that are nearly too realistic and beautiful to burn. Hello everyone! I'm proud to introduce Point a la Ligne to The Grommet. 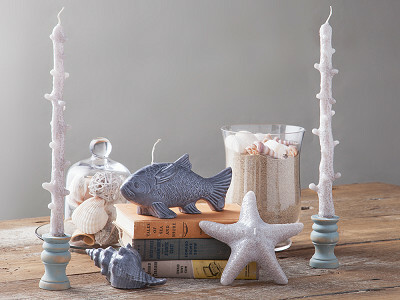 These candles tell stories of holiday memories, childhood sweets, and traveling dream. I'd be happy to answer any questions you have! Can these be shipped to Florida? Asking due to our hot weather this time of year and these being wax. @Muriel Good question, but no worries, we have not experienced any problems shipping to Florida this time of year. Are these candles scented? What do they look like after they have burned for awhile? @Susan These candles are not scented and they burn straight down along the wick so the outer shape will remain. They are so pretty, that I wouldn't want to burn them, just display them!!! I'm moving back to Hilton Head Is. SC soon and will wait till I move to get them!!! But I will get them!! You are not alone, Carol! Our CEO Jules said her guests would know they were getting the royal treatment if she lit them while they were visiting. What a perfect housewarming gift! I hate to sound like a broken record, but...treat yo self! Jules, I'm hoping none of your potential guests are reading at this point and you haven't been outed. If so, I'll delete this. What are the approximate dimensions of each? Thank you. @janet If you click through the picture of any of them you will get more information, including dimensions. 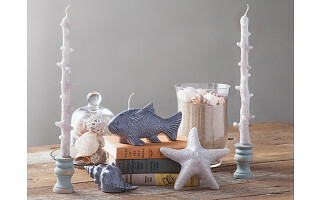 Fish: 9" x 2.75" x 4"
Starfish: 7" x 7" x 2"
Sea shell: 6" x 3" x 3"
Candlesticks: 2" x 2" x 13.5"
Get all four, you'll be living in Atlantis! Around what temperature do they melt at? Hi Evan, it's at the same temperature as your standard candle which is approximately 130 degrees. The biggest difference with Point a La Ligne candles is the slow burning wick which will have these beautiful candles burning nice and slow! Candles add something special to a home. The flickering of a flame is both mysterious and comforting; we can't resist the cozy glow. Point a la Ligne candles are made from the highest quality ingredients, and they burn slowly with no drips or smoke. The company began in Bordeaux, France over 100 years ago. Their inspiration is "to bring together the beauty, warmth and magic of the flame." Treating their designs like a high fashion brand, Point a la Ligne debuts two collections per year: Spring/Summer and Fall/Winter. People wait to see what kinds of unique designs the team will unveil each season. It's no wonder that fashion houses like Prada, Armani, and more have Point a la Ligne design candles for them. The Atlantic Shore collection looks like it's been plucked from the ocean. Each candle is handmade and hand-painted by expert craftsmen. Painstaking detail and a smooth glaze leaves them looking almost more like porcelain than wax.